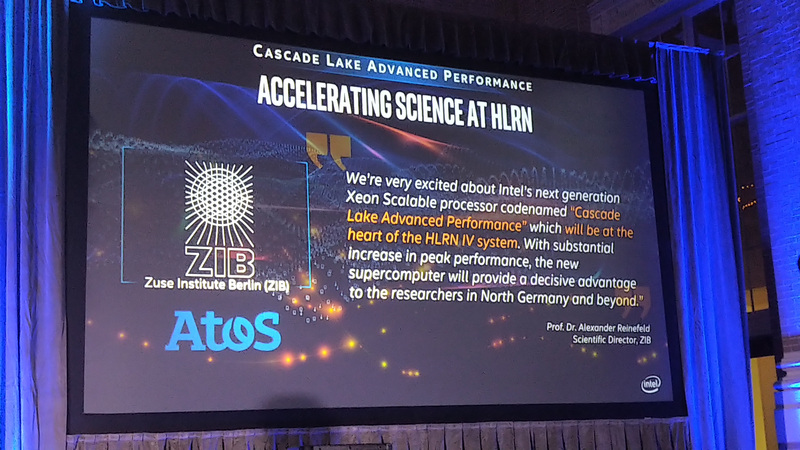 One of the announcements from last week involved Intel and its new Cascade Lake Advanced Performance category of processors to launch next year. These new processors will be based on combining two 24-core Cascade Lake-SP processors on a single package substrate to offer a single socket 48-core option with a total of twelve memory channels. 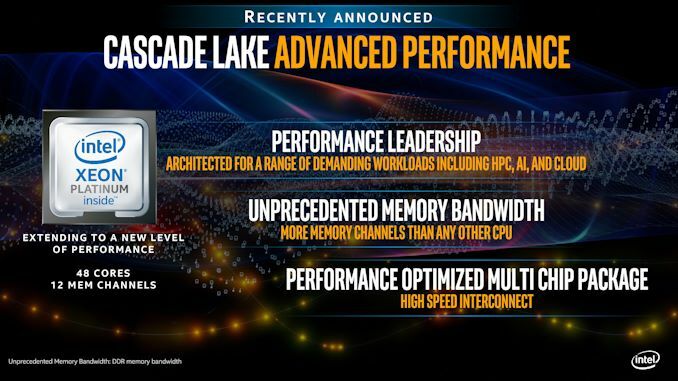 The Cascade Lake-AP parts are going to be launched next year, and until then Intel is putting out some internal benchmark numbers. When we are this far away from a product launch, all benchmark numbers should be taken with a grain of salt. This goes doubly so for vendor supplied benchmarks. However, Intel is on the warpath to promote what it sees as a new product family within its portfolio, even if it is only set to come out next year. At the announcement last week, Intel offered Linpack and Stream Triad as two main high-performance metrics as comparison. Today Intel is also offering more ‘real world’ metrics. 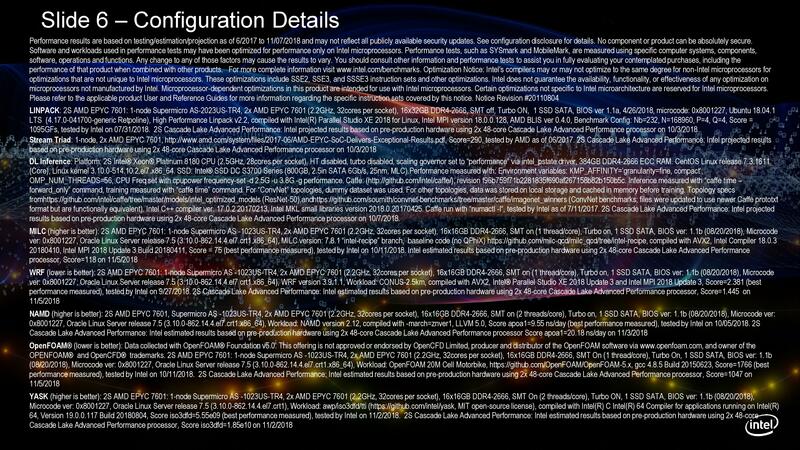 These metrics are, to quote Intel, ‘estimates based on pre-production hardware’. This means that the hardware is not ready yet, and these are values based on the engineering samples running but extrapolated to an expected benchmark value. Add another dump truck of salt on these numbers. The slide with this data is in the gallery below. In each case, Intel is comparing a dual-socket Cascade Lake-AP system with a dual socket EPYC 7601 system. 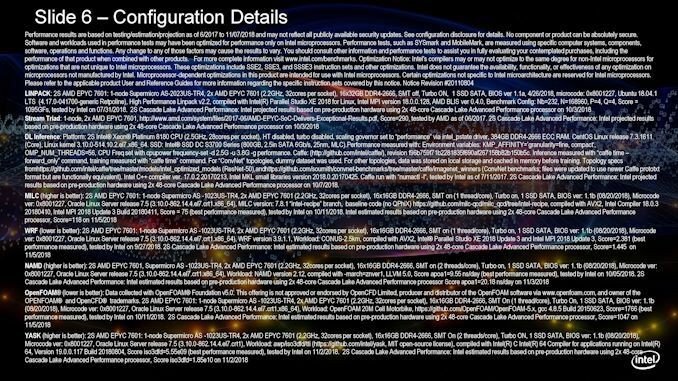 Intel’s information slides go through how it set up all of its AMD systems in detail, however it does not disclose how the Cascade Lake-AP systems are set up by comparison, presumably as to not disclose any additional set-up numbers. For the most part, we don’t put much stock into vendor supplied benchmark numbers. It’s easy for a vendor to claim a multiple when doubling particular compute resources, but when it comes to real world tests, companies like Intel have to try and promote its future products to potential customers. This is what this is. However, no matter how many numbers come out, these are impossible to verify independently. Wait until the AnandTech review, of course. Intel also disclosed a number of ecosystem partners who are getting ready to deploy Cascade Lake-AP, as well as an offical declaration of the Cascade Lake-AP deployment at HLRN. 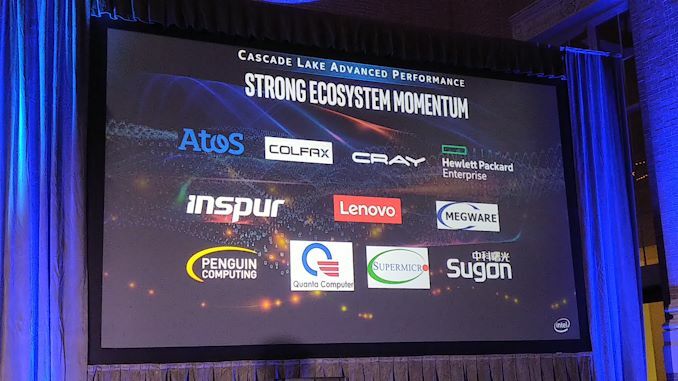 Cascade Lake-AP is set to be launched alongside the Cascade Lake-SP in the first part of 2019, although Intel states that Cascade Lake-SP will ship for revenue in 2018. This week we are at the Supercomputing trade show - hopefully there will be a demo somewhere that we’ll be able to see and talk about. Translation: Intel is getting worried, like, for reals this time. He wouldn't need to say anything. He could just say "Look we're taking two of these and cramming together." "Doesn't that seem like... overkill?"